I recently received a very nice story from Ashley Jenkins, one of our graduating seniors. She kindly agreed to let me share her words here. Read on to learn about the journey that brought Ashley to Peirce. It was summer of 2010, after watching my husband get his associate degree from Peirce College, when I decided to go back to school. But let’s rewind a little bit further to my husband’s journey of going back to school. In 2008, my family was faced with a hardship that was almost impossible to recover from. My husband, who at the time was a real estate broker, was forced to close his office due to the fallen economy. As time went on it was hard trying to stay afloat on our bills and deal with the everyday stress of life. The straw that broke the camel’s back was when we received a letter from our mortgage company saying that our home was in foreclosure. It was then that I felt that my husband and I needed to make a decision about our next career moves so that we could generate an income for our family. I knew that we never wanted to be in this type of situation again in life, and although my husband had been a broker for five years and sold real estate for 20 years, I knew that he needed more. When we talked about what our next steps should be I asked him how he felt about going back to school to get his degree. My husband is a very smart man and I knew that he would be interested, but the fear of doing something he hadn’t done in years was a process to get over. I spoke to a close friend to get her opinion about colleges with the working adult in mind, and she told me about Peirce College. I did some research and bought it to his attention, and before we knew it we had an appointment to see Paul in Admissions. Vector was very skeptical about the process and how we would pay for a college education, but for some reason I wasn’t worried. Vector kept saying to me “I’m not going to get in,” “I won’t be able to get financial aid,” “I won’t be able to do the work.” Anything Vector could say to prepare himself for rejection from getting a degree he would say. I promised my husband that if he got into school that I would do anything that I could to help him get adjusted. The first couple of classes were an adjustment but he did great and I was so proud of him. 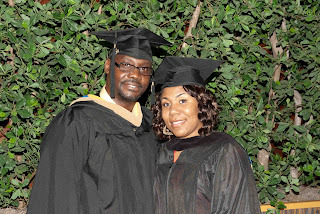 Before we both knew it, Vector was graduating with his associate degree and he graduated with honors. I can’t begin to tell you how I felt the day he walked across the stage to accept his degree that he (and I) worked so hard for. I remember at the graduation the president of the school talked about family and how they are also the ones receiving the degrees for all the love, support, sacrifice, and long nights it took to get it. Ashley’s story is to be continued, but to give you a little preview -- she has already started her journey towards her bachelor’s degree. Thank you, Ashley, for sharing this with us! And congratulations to Ashley, Vector, and all of our other 2012 graduates!